The land that became Tennessee was travelled by native populations and early explorers before becoming the sixteenth US state on the 1st of June 1796. It had originally been part of North Carolina. Many of the families who became Tennesseans had moved into the area from Virginia, North Carolina and other colonies. Let's look at a later young Tennessean, and see what records might be helpful in researching his family history. George Clark Watkins was born in Ripley, Lauderdale County, Tennessee. According to the 1940 U.S. census, he was born around 1903. If George was our ancestor, we would know if he was deceased and could check a death certificate or obituary. But since we are starting our research in Tennessee, let's consider finding a birth certificate for George. Statewide registration of births began in Tennessee in 1908. The four major cities (Chattanooga from 1879, Knoxville from 1881, Nashville from 1881, and Memphis from 1874) began local registration. These records are available at Ancestry.com. From 1908-1912, vital records were maintained by the County Court clerks in each county. These records for most counties have been microfilmed and are available at TSLA. There was no statewide registration law in place in 1913, but birth certificates were created statewide from 1914 until the present. Those birth certificates are available from the Office of Vital Statistics, Tennessee Department of Health. Some individuals (generally born before 1908) would provide evidence of their birth in order to obtain a delayed birth certificate. An index and the certificate image of these delayed records in Tennessee for individuals born 1869 through 1909 are available at Ancestry.com. Here is the delayed birth record recorded for George Clark Watkins. Note that it contains an affidavit by the attending Physician at the birth of George, Dr. Lusk. It also contains the names of the parents and birth places as reported by Mr. Watkins. We want to record all relevant information, but note that it might not be completely accurate. 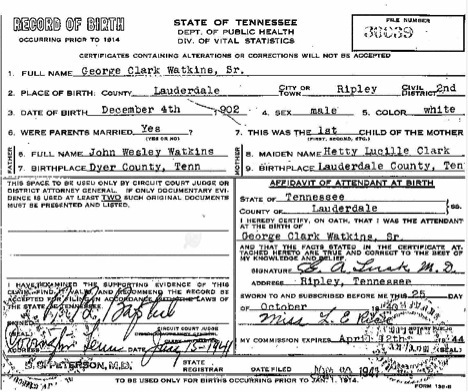 Since we know that Mr. Watkins' mother was reported as Hetty Lucille Clark, we might consider locating her death certificate to learn additional information about each parent. Just like the birth records in Tennessee, the four large cities (Chattanooga from 1872, Knoxville from 1881, Nashville from 1874 and Memphis from 1848) began some registration. This expanded with records from 1908-1912 maintained by the County Court clerks in each county. Both series have been microfilmed. There was no statewide registration law in place in 1913. TSLA has created an index to those records from 1914 through 1933 as well. Archives.com also has the death certificates for Chattanooga, Knoxville, Nashville and Memphis from 1908 and the entire state in 1915; this collection ends at 1958. 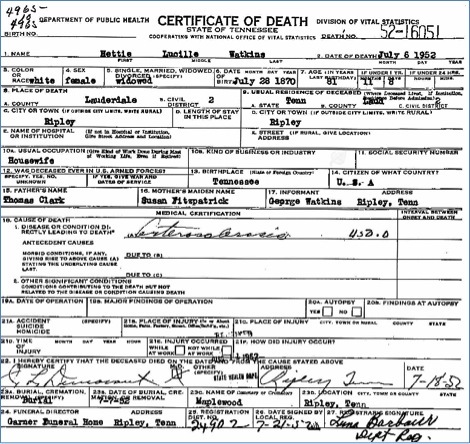 If the death certificate is not yet available or can't be located, use the Death Record Index from Shelby County and request a death certificate from Vital Statistics or use the information to locate an obituary. Hettie Lucille Watkins passed away on 6 July 1952 in Lauderdale County, Tennessee. Note the difference in the spelling of Hettie/Hetty between the two documents. Again, we will extract all information from this document for analysis. Notice that the informant, George Watkins, provided the name of Hettie Watkins' parents and her date of birth. As we collect new information, we should review and compare against the information we have. The mother of our subject, George Clark Watkins, was named Hettie Lucille Clark Watkins. Perhaps, George's middle name was selected because it was his mother's name. We have no record that reports that information, so we might want to note that as supposition or conjecture. We want to note by citation the source for all information we collect in our research. Since the delayed birth certificate of George Clark Watkins indicated he was the first child of Hettie Lucille Clark Watkins, let's find this family on the 1910 U.S. census. They should be living in Lauderdale County, Tennessee. We can try searching for any of the known family members. If we try to specifically look for Hettie or Hetty Watkins, we don't find an exact match. Hetty Watkins is indexed as Betty Watkins. We could look for George Watkins who should be six or seven years old. As we examine the details reported in this enumeration, we see that J.W. and Hetty have been married eight years. This would be 1902 by rough calculations. If you look carefully, you will see the little superscript 2 above the M on the line of Hetty. This indicates this was a second marriage for her. This enumeration also reports that George is the only child born of Hetty. They are all born in Tennessee, but Hetty's parents were born in Virginia. Let's look for the marriage of Hetty Clark and J.W. Watkins about 1902. The process of obtaining a marriage license in Tennessee included a marriage bond (parental approval when required), then a license was issued, this would include a return notice by the officiate indicating marriage ceremony. After 1838, counties were required to bind marriage records in books. This explains why early loose marriage licenses may not be available. Once the use of registers became standard, many counties used printed marriage registers which recorded on one page per couple all the documents created in the steps. Most Tennessee marriages, however, do not supply information about birth locations or parents of the couple. Although not comprehensive, good Tennessee marriage records may be found on Archives.com, Ancestry.com and FamilySearch. Many counties of the TNGenWeb project have created indexes of local marriage records. When using online resources, remember not all database collections are equal. Additional marriage documents might have been filmed/digitized/indexed at different times. The original marriage records are under the jurisdiction of the County Court Clerk and/or local County Archives. Since this was the second marriage of Hettie, she was first married to a Mr. Scott. In the registration of marriage bonds, we learn of the bondsman. This individual was usually a close friend or relative of the couple. Agreeing to co-sign a bond, the bondsman would be financially responsible if the marriage conditions were declared invalid and the groom was unable to pay the penalty/damages. We also learn who solemnized or conducted the marriage ceremony. If a minister, we may learn the church or denomination. Here's a copy of Hettie L. Clark's first marriage in Lauderdale County, Tennessee. One of the great resources available for beginning Tennessee researchers includes the online resources of the Tennessee State Library and Archives. One of my favorite is the index to the published biographical sketches by Goodspeed. They are arranged by name and include the county of publication. However, they only index the subject, not all names within the biography. William R. Glenn is a son of David and Nancy (Rainey) Glenn, who were North Carolinians, born in 1800. They were brought to Middle Tennessee in childhood and there married. Of eleven children born to them -- five sons and six daughters -- six are living. They were Methodists and the father was a Whig and a farmer, and owned 640 acres of land. He died about 1863 and his widow in 1881. Our subject is of Scotch-Irish descent on his father's side of the family. He was born in Williamson County, January 29, 1837, and was reared on a farm. He attended the common schools, and at the age of sixteen engaged as salesman in a dry goods store, continuing about two years. He then turned his attention to farming, and in 1861 enlisted in the Confederate Army in Company J, Ninth Tennessee Infantry, serving nearly four years, and was neither wounded nor taken prisoner. In 1870 he was united in marriage to Mary M. Graves who was born June 7, 1846. They have one child, William E. Both husband and wife are members of the Methodist Episcopal Church South. Mr. Glenn is a Democrat and cast his first vote for Fillmore. He owns 225 acres of good farming land. Our research should be based on answering a question. Based on the information we have collected from Hettie C. Clark Scott Watkins appearance in the 1910 census of Lauderdale County, and her approximate date of birth, we might have new questions to research. For example, does Hettie appear in other census records? Our interest may lead to learning more about the bondman for Hettie's first marriage, Mr. Fitzpatrick. We should be very clear in developing a plan for research by leading with the question we want to answer. As you begin your research, it might be helpful to know that most original county records remain in the counties, either an Archives or the Office where they originated. TSLA has a microfilm copy of most county records and maintains an inventory of county records on microfilm. Be sure to take a look at this useful tool.